Understanding how gaseous precursors aid in secondary organic aerosol (SOA) formation and growth has been the focus of several previous campaigns (BAECC and SOAS ). While ambient measurements are important for understanding these processes, they are often complex due to many systems interacting at once. In order to parse out the effects of individual systems on the total atmospheric SOA, chamber studies are conducted. These chamber studies allow a more targeted study of individual systems. The goal of the SOA Formation from Forest Emissions Experiment (SOAFFEE) was to isolate SOA formation from different gaseous biogenic precursors and determine their SOA bulk properties and yields, as well as the chemical compositions of both the gas and particle phases. Conducted at the Pacific Northwest National Laboratory (PNNL) Atmospheric Measurement Laboratory (AML) in eastern Washington, SOAFFEE was a collaborative project between the Thornton, Shilling, and Ehn research groups. 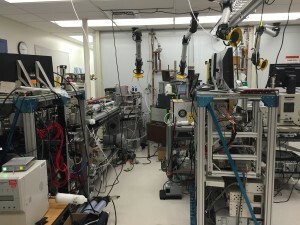 The SOAFFEE experiments were run similar to those during the 2014 campaign at PNNL the chamber was run in steady-state mode and the UW mass spectrometer was outfitted with the FIGAERO in order to measure both gas and particle phase chemical compositions. Several SOA formation systems were studied, including various monoterpenes oxidized by OH or ozone at both low and high-NOx, and the oxidation of IEPOX, a second generation product of isoprene oxidation that is reported to significantly contribute to SOA growth, particularly in regions with acidic particles. These experiments will help elucidate ambient observations as well as provide insights into the specific systems studied. This work was funded by the U.S. Department of Energy.